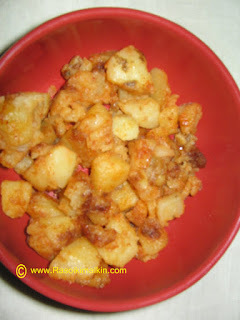 Peel off aloo and chop into medium sized pieces.Place a pan on the stove,add oil to it,and also add the chopped aloo pieces in to it,after heating.Stir fry occasionally with a lid on.When lid is placed the pieces will turn tender and soft.Add salt. After the aloo pieces are fried add dhania powder,jeera powder,and chilli powder,saute well.The easiest dish which even amateurs can do but also a tasty one. The aloo is washed,boiled and peeled ,then made in to pieces and fry till they are cooked.Then sprinkle salt,chilli powder as for above dish..
simple and delicious.. looks perfect ! !